To understand the cultural and political war to destroy our Republic under God I always want to know what the Elite Media is doing therefore I watch the MOST far Left BIG-Media outlet, MSNBC. The other day Daily Rundown's Chuck Todd in a sarcastic tone stated, "Is it safe to declare the 113th Congress the least productive on record?" Todd proceeded to lambast the Republicans in Congress as obstructionists comparing them to the so-called GOP "Do Nothing 80th Congress" under Harry Truman between 1947-1949. Sometimes THE best thing for Congress to do is nothing! The "Buck Stops Here" President Truman after WWII wanted to explode the Federal government with taxes, spending and advancing FDR's New Deal through his so called "Fair Deal" that desired to "spread the wealth" and expand socialism in America like never before. Those 1947-1949 Republicans believing in their platform, which called for "founding father limited republicanism" refused to go along with Truman's Big government progressive schemes. Therefore, they "did nothing" as good limited government representatives should always do in the face of Big government's propensity to pass more and more laws, and legislation, rules and regulations that rarely if ever limit government but almost always expand government and limit liberty. Since Barack Obama took office there has been a mantra by Lefty politicos and talking heads that Republicans are evil obstructionists and not willing to work with Democrats on passing more Laws. With 1/3 of the power, the GOP House has legally, Constitutionally and legitimately slowed down the passing of various laws that they deemed unconstitutional and or designed to advance Democrat-Socialism. The bottom line is: There IS a profound difference between their ideological platforms. Democrats call for Socialism and the expansion of Federal government power in Washington D.C. while Republicans call for authentic limited government based on the republicanism of our Founders. Hold on Tea Partiers and libertarians before you go nuts on me! Yes, I know many Republicans within the establishment don't practice their platform and aren't guided by those principles, but there are those in the Republican Party who do and are at least fighting to slow down the Democrat Big Brother Machine. If only all of our Republican representatives acted and voted by their platform like the Democrats do-we be much better off-but that is another topic for a later date. Our Founding Fathers had principles that were always suspect of government good intentions through an inordinate amount of legislation especially through a Central government at the Federal level. They knew that the great Roman Statesman Tacitus warmed that, "the more numerous the laws, the more corrupt the state." This dictum guided our Founders in designing a Republic that while profoundly believing in the Rule of Law, believed we were to have a few, limited laws to protect freedom but not too many laws to harm life and destroy liberty. Thomas Jefferson taught us that the U.S. Constitution gave Congress the power to criminally punish "treason, counterfeiting the securities and current coin of the United States, piracies, and felonies committed on the high seas, and offenses against the law of nations, and no other crimes whatsoever." Today the Federal criminal code has listed over 4,450 criminal laws and growing. The Federal Registry of over 75,000 pages records all of the federal government regulations and imposes thousands of rules on businesses in America today. The Federal tax code has over 700 forms, covers over 17,000 pages with thousands of rules and regulations on hard working American citizens. If you read 750 pages a week of the US Federal Code it would take 25,000 years to complete. That is just at the Federal level imaging also adding the unfortunate growing amount of State legislation to that list. Also the "Fourth Branch" of progressive government "The Un-Elected Administrative-Bureaucratic State" is working in tandem with an unconstitutional Federal government exploding government like never before and it must be stopped before it's too late! Any government big enough through voluminous laws to theoretically give you everything you want is big enough to destroy your God given life and liberties. 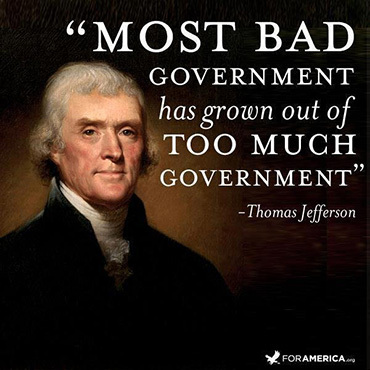 If my study of history has taught me anything it is that almost all-bad government derives from big government, which was created by too many laws that made it big in the first place. As government laws grow our liberties die. Today it would be wise and prudent to simply live by the basic laws of our Constitution as originally understood and to apply God's 10 Commandments to our lives. In doing so we would once again discover the beauty of our Republic under God and the liberty a limited Constitutional government secures. So while the Elite Media pundits might pontificate and lambast the GOP and the so-called "do nothing" Congress... in the spirit of authentic republicanism of 1776, I declare "the government that governs best governs least, go home Congress and leave us alone Washington D.C.!"